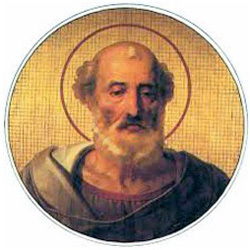 The Martrylogy says that Pope St. Julius I (337-352) fought for the Catholic Faith against the Arians. He acquired the fame of sanctity and rested in peace after many glorious interventions in the Arian controversies. In his Lives of the Saints, Engelbert of Cologne reports that Julius I fought against the Eusebians, who continued the Arian heresy and had a violent hatred for St. Athanasius, Bishop of Alexandria. When St. Athanasius tried to re-take his See of Alexandria, the heretics opposed him and appealed to the Pope, who convened the Council of Sardica in Illyria (343). 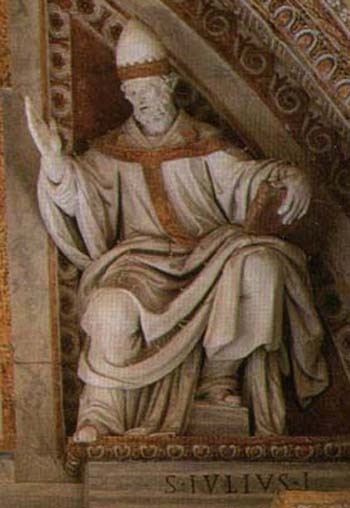 Pope Julius received Athanasius in Rome to affirm his support of his doctrine and position. The Council confirmed the innocence of the Holy Bishop of Alexandria. The Council dealt with three important matters: the truths of the Catholic Faith, the objections of the Arian followers of Eusebius of Nicomedia, and the complaints of the Eusebians against St. Athanasius. Eight heads of the Arian faction were deposed and excommunicated, that is, removed from their episcopate and the communion of the faithful. “We have always believed and professed that which we have now experienced and heard. 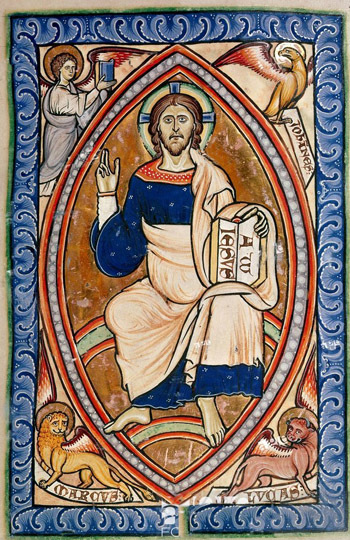 What the Blessed Paul, Doctor of Nations, said about himself is true; to wit, that since Christ the Lord dwelt in him, there can be no doubt that the Spirit spoke through his breath and resounded in his mouth. The Bishops of Sardica, the Fathers of the Council that was taking place in that city, sent this most beautiful document to Pope St. Julius I with this expressive thought: Like St. Paul who on a certain occasion said that Christ lived in him and spoke through his mouth, so also the Pope, in the communion of his thoughts, was present in the minds of those faithful Bishops and spoke through their lips. And what was the goal of those words? To denounce the schismatic wolves who were coming to stealthily take the flock, etc. This letter is the least possible ecumenical document that you can imagine. That is, without the support of the Pope, those Bishops would not have a defense against their enemies. But, with his support, with the Pope speaking through their mouths, they were able to put the enemies to flight. Indeed, they deprived eight of those Eusebian heretics, who were Semi-Arians, of episcopal orders and excommunicated them. So, you see, first, the rigor of the language of those conciliar Fathers against the enemies of the Church; and, second, their conviction that both the Pope’s task and the Bishops' task was to fight against the enemies of the Church. You have here excellent examples of anti-ecumenism, which we should keep in mind in this epoch of so many confused and contradictory teachings coming from the highest places, from those who should transmit the true teaching of the Church to the faithful.